We recently had the pleasure of Hannah Carmack’s company at WROTE. To listen to her episode, check out Episode 150: I Guess What Changed Was Me! Set against the backdrop of the Cold War, the story is told by seven different characters, who all have code names and mutations, giving you at least fourteen names to remember. 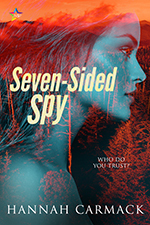 If you liked the multi-character aspect of Game of Thrones, this book’s multiple points of view and complex, espionage plot is for you. Most of the story takes place in the dense backwaters of North Carolina, which means that the Cold War element of the story is primarily told, rather than shown. I struggled to find a sense of history. Unless I had been informed that the book was set in this time period, I may well have not picked it up. Having said that, the writing was intelligent and the dialogue sparky and crafted well. I sensed a real affection between the author and her characters, as well as a sense that she knew what was happening, even if I hadn’t pieced everything together yet. Because of the back and forth styling, the switch between POV’s and the numerous changes of name, I struggled to engage with a character. I appreciate that others will love this challenge, and for a first novel, it is a wonderfully ambitious mix of spy novel and science fiction. Finally, I do love the cover. It certainly captures the myriad of characters, some stronger than others, and the kaleidoscopic nature of the work.